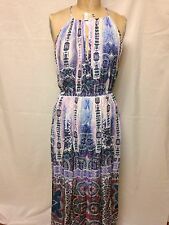 BEAUTIFUL NANETTE LEPORE SWIM COVER UP TUNIC 100% RAYON MULTI COLOR SIZE XS EXCELLENT CONDITION EMBROIDERED STITCHING AROUND NECK LINE, SLEEVE HEM & AT BOTTOM HEM LENGTH ARM PIT TO ARM PIT - 18" LENGTH FROM HPS AT CB - 32"
Nanette Lepore Tropical Floral Swim Cover Up Dress. Length from shoulder to bottom hem 28in. NANETTE LEPORE SWIM. By Nanette Lepore; imported. Rayon; hand wash. Regular sizing: S=4-6, M=8-10, L=12. A spectacular finish for your swim look, this Nanette by Nanette Lepore cover-up features cold-shoulder cutouts and a high neckline that hit all the current notes. Knee length. We are DG Fashion Outlet. Nanette Lepore Portofino Embroidered Bandeau Strapless Cover Up Romper Size: Medium Color: Marine Retail: $156 You'll always be vacation-ready with this festive Nanette Lepore® Portofino Solids Bandeau Romper Cover-Up. Strapless romper is crafted from a soft and lightweight fabrication that effortlessly drapes the body. Elastic neckline features embroidered detail. Chic popover detail at the bodice. Relaxed fit through the thigh. 100% rayon. Slip-on design. Straight hemline. Elbow-length sleeves with a cold-shoulder cutout. Sleeveless, halter neck, front keyhole, back keyhole with tie closure and side slits. Material: 100% Rayon. Waist – 30” (with elastic relaxed). Total Length – 45”. Size: Large. Gorgeously constructed swim dress coverup by Nanette Lepore. Flattering, squared neckline both front and at back. Fluttered short sleeve. nice length for coverage, allows for airflow. Hangs nicely off body in swing style. Nanette Lepore Floral Cold Shoulder Cover Up Swimsuit NWT C-1. Bikini Love Beach, LLC. Color: White Floral Print. Cold shoulder drawstring neckline. Sleeve length is 18". Full length is 30". New with attached tags!! Cute as a dress or over swimsuit! Sz XS USA...UK6...EU 34. Retails $140! Beautiful Nanette Lepore skin cover up. Beautiful back! Very eye catching piece. Perfect condition. 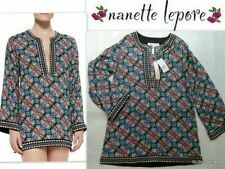 Nanette Lepore Swimsuit Cover Up Caftan Sz M. 100% viscose. Elastic waist. Hand wash cold. 100% viscose. This is a gorgeous Nanette LePore Swim tunic ( see pic ). Length: 40" from top to bottom ( at the back ). Chest: 15 to 22" from armpit to armpit ( unstretched ). Fabric: 100% Rayon. Nanette Lepore. Turquoise Vest Cover Up. Nanette Lepore Talavera Harem Pant. Color/pattern: azure. 100% viscose. Drawstring closure. Front wrap closure. Hand wash cold. Nanette Lepore Swim Mantra Embroidery Tunic Cover Up! Batwing cover tunic with lace up detail at bust, cold shoulder sleeves and a deep V back. Gorgeous beaded embroidery. Lining: 87% Nylon, 13% Elastane. ***PLEASE CLICK "ITEM DESCRIPTION" TO VIEW THIS AD IN IT'S ENTIRETY***. Nanette Lepore Swim Tunic For Sale. • Embroidered along Neckline, Sleeve Cuffs and Hem. • 3/4 Length Sleeves. • 100% Rayon. Nanette Lepore is a New York fashion designer. Nanette Lepore swimwear cover up stretch dress. A great little Dress to wear over your swimsuit or bikini. This is a beautiful quality dress with Elastane and Viscose in it so it is stretchy and feels slightly silky. 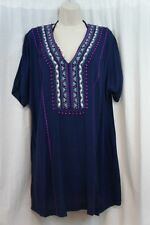 Nanette Lepore Blue White Printed Cold-Shoulder Talavera Tunic Cover-Up S.
Playa Nayarit Caftan Cover Up. Nanette Lepore. Size Large. 100% Rayon. Colored lining. I describe all my products and indicate what is included and what is not. We might just be able to find what you are looking for. Light weight soft fabric. With cold shoulder styling and a keyhole cut-out, you will arrive in style whenever you wear this cover up. No cup support. Sizing & Fit. Hand wash, cold. Mid-thigh length. Relaxed fit. 100% Viscose. NANETTE LEPORE SWIM. By Nanette Lepore; imported. Rayon; hand wash. length from shoulder: 32". Regular sizing: S=4-6, M=8-10, L=12. Nanette Lepore Portofino Embroidered Bandeau Strapless Cover Up Romper Size: Small Color: Marine Retail: $156 You'll always be vacation-ready with this festive Nanette Lepore® Portofino Solids Bandeau Romper Cover-Up. Strapless romper is crafted from a soft and lightweight fabrication that effortlessly drapes the body. Elastic neckline features embroidered detail. Chic popover detail at the bodice. Relaxed fit through the thigh. 100% rayon. Material: Rayon Size Type: Regular Style: Cover-Up. This is a gorgeous Nanette LePore Swim tunic ( see pic ). Length: 36" from top to bottom ( at the back ). Chest: 22" from armpit to armpit ( unstretched ). Sleeve:30" from top of the shoulder to end of cuff.